If you need to make changes to your registry, the fastest way to do it is to use a registry finder. Windows 10 has a built-in Registry Editor, but this tool has some limitations. If you want to quickly find a desired key or value in your registry, we strongly recommend that you try one of registry finder tools from our list. What is the best registry finder for Windows? If you’re looking for a simple registry finder, this tool might be just what you need. The application allows you to browse your registry with ease, but you can also delete and rename both keys and values. 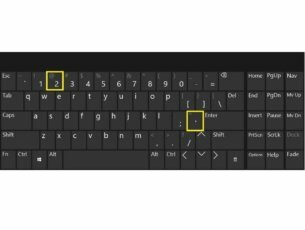 Thanks to the tabbed interface you can easily open multiple keys and make the necessary changes. It’s worth mentioning that all your open tabs will be saved after you close Registry Finder. As a result, you can always continue working on a specific key even if you accidentally close the application. In order to quickly navigate to any key you can use the address bar at the top. Simply paste the path to the desired key and you’ll instantly navigate to it. The application has a powerful search feature that can easily find any value or key in your registry. It’s worth mentioning that the search results are shown in a different tab, therefore searching doesn’t interfere with your work. This is especially useful because searching the registry can take a while sometimes, so you won’t have to wait idly while Registry Finder performs the search. The search supports wide range of parameters, so you can easily find any value that you want. All search results are displayed as a list so you can easily navigate through them. The application will also show you the location where the match occurred along with additional information such as key name, value name or data value. In addition, all matched data is highlighted in red, therefore it’s easy to spot. Of course, you can easily navigate to a specific search result simply by double clicking it. We have to mention that this tool has a replace feature that can replace one string with another. The replacement affects only values from Find Results tab, but if you want, you can perform replacement only for selected values. Registry Finder also has a powerful history feature that allows you to restore any deleted or replaced entry. This feature is especially useful if you want to revert your registry to the previous state. Registry Finder is a great application that will allow you to perform changes to your registry with ease. Thanks to the powerful search feature you’ll be able to perform changes to desired values in a matter of seconds. The application is completely free, and since there’s a portable version available you can run it on any PC without an installation. If you’re not satisfied with the search options in Registry Editor, you might want to consider using this tool. Unlike our previous entry, this tool doesn’t work as a registry editor, so you can’t make any changes to your registry using this tool. 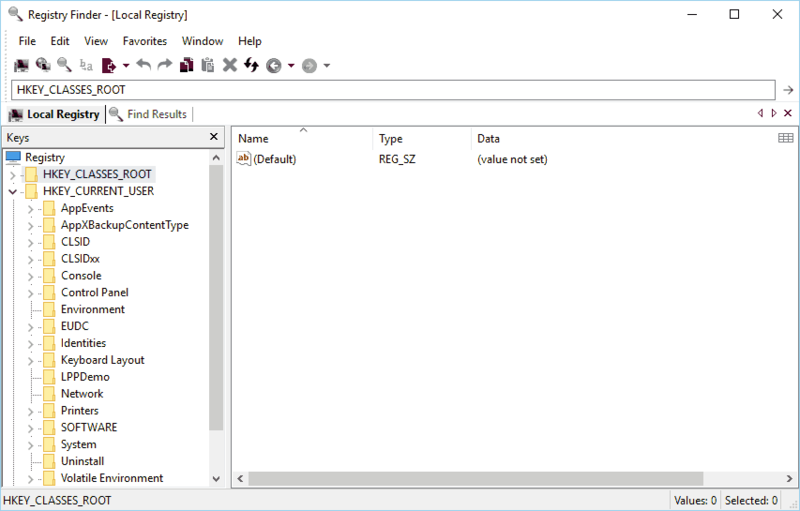 However, this tool works perfectly with default Registry Editor, so you can use RegScanner to perform searches and find the desired keys with ease. After finding the desired values, you can easily access them with Registry Editor. RegScanner has an extensive search feature that allows you to customize your search properties. For example, you can choose which base keys to scan, but you can also display keys that are modified during a specific time period. In addition, you can also display only specific types of data if you want. After performing the search, all results will be displayed in a list so you can easily navigate to any value simply by double clicking it. The list of results is populated in real-time, so you can see the results as soon as they are found. It’s worth mentioning that this application can also search registry on a remote computer. However, before you can do that you need to log in to the remote computer using the administrator account. RegScanner supports exporting, so you can easily export your search results as a .reg file and use that file for backup. In addition, you can also save the list of results as a text file. Although this tool doesn’t offer registry editing, it allows you to easily delete any value right from the application. 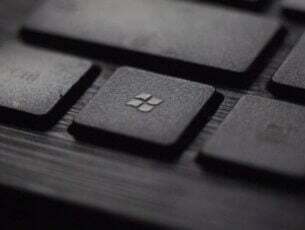 This is rather useful if a specific value or a key is causing a problem on your PC. It’s worth mentioning that deleted keys and values are stored in a .bak file that you can use to restore them. This file is created in the application directory, so you can easily access it. If the application can’t create the .bak file, the selected item won’t be deleted. 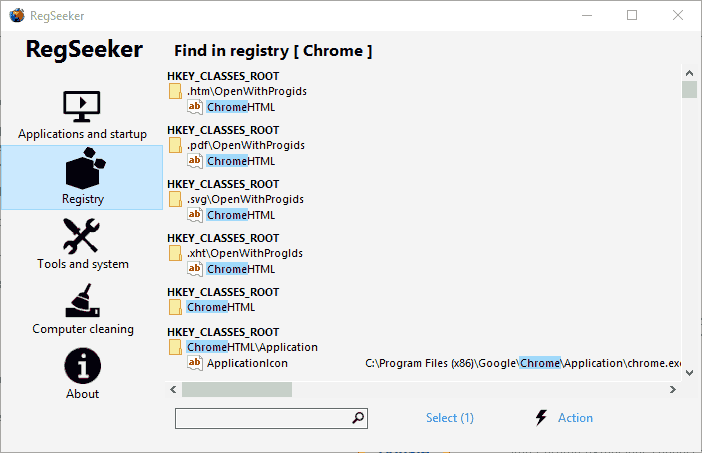 Another feature that you might find useful is the ability to open any registry path from your clipboard. Using this feature you can simply copy a path and open it in Registry Editor with a single click. RegScanner is a great registry finder tool, but it doesn’t work as a registry editor. This means that you’ll have to completely rely on Registry Editor to make changes to your registry. This tool offers advanced searching options, so you should be able to find any value with ease. Lastly, this is a completely freeware and portable application, which means that you can use it on any PC without an installation. Another great registry finder that we want to show you is Acelogix Registry Finder. The application offers powerful search engine, and with the friendly user interface using this tool should be a breeze. To perform a search simply select the type of data that you wish to search for and the type of hives that you want to scan. We have to mention that this tool also allows you to scan local registry and registry on a remote computer. After selecting the search parameters, you just need to enter the string that you want to search for. It’s worth mentioning that the application also supports regular expressions, wildcards and hex strings. If needed, you can also search for values that have been modified between a specific time period. Acelogix Registry Finder also has a useful folder tree in the left pane that you can use to sort your search results. We have to mention that this application doesn’t allow you to modify your registry, so if you want to change a specific value, you’ll need to use Registry Editor. 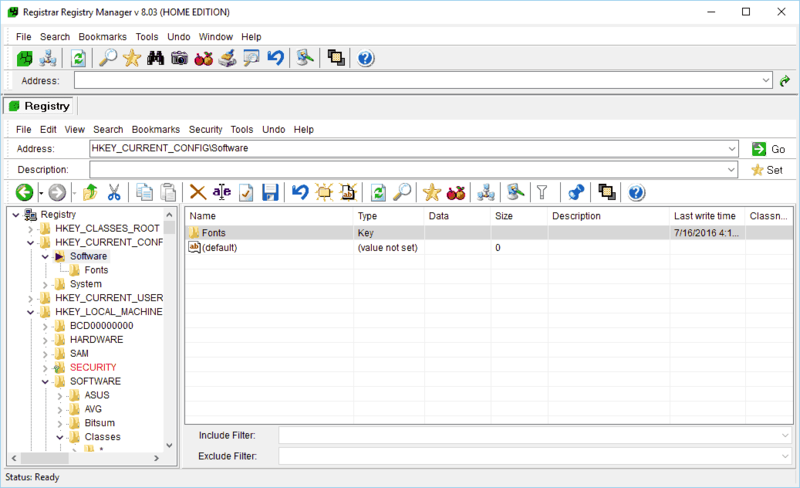 This application offers full integration with Registry Editor, so you can easily access and edit any value. To edit a value with Registry Editor you just have to double click it in the list of results. The application allows you to delete registry entries, but you can also export your search results and use them as a backup. Acelogix Registry Finder offers friendly user interface, so you should be able to search your registry with ease. Although this is a great registry finder, we have to mention that this tool isn’t free, so you’ll need to purchase it if you want to continue using it. The application offers a 30-day free trial, so feel free to try it out. Another great tool that can help you search and edit your registry is Registrar Registry Manager. The application uses tabbed interface thus allowing you to perform multiple operations at the same time. Using this tool you can edit registry on a local computer or on a remote PC. It’s worth mentioning that this tool allows you to back up and restore your registry with ease. This means that you can easily fix any problem that occurs after modifying the registry. The application offers a powerful bookmark editor so you can easily bookmark registry keys and save them for later use. Bookmark editor supports categories, and there’s even support for coloring and custom descriptions thus allowing you to easily differentiate your bookmarks. We also have to mention that this tool supports multi-level undo, so you can easily revert any changes. The application supports registry defragmentation and there’s even a registry monitor available. Thanks to the latter, you can see a detailed log and check which applications have accessed your registry. Registrar Registry Manager also has a powerful compare tool, so you can easily check the differences between two keys. The application also offers advanced search feature that can quickly search your registry. Your search results will be displayed in a new tab so you can do other things while searching your registry. The search is highly customizable and you can perform text, binary and regular expression searches. You can also apply various filters and specify data size, value type and last write time in order to narrow your search. Of course, you can easily modify any registry value or jump to it right from search results. Registrar Registry Manager is a great tool and it offers an advanced search feature that allows you to find any value in your registry. Thanks to the available features, this tool can also work as a Registry Editor replacement. The application is free to use, but the Free version doesn’t have access to some advanced features. If you want to access all features, you’ll need to purchase the Pro version. RegSeeker is a useful tool that can clean your registry and optimize your PC. The application has a simple user interface so it’s perfect for new users. Using this tool you can manage startup items, services and drivers. In addition, you can view and uninstall all installed applications on your PC. The application also allows you to see your system information which is rather useful if you want to learn more about your hardware. 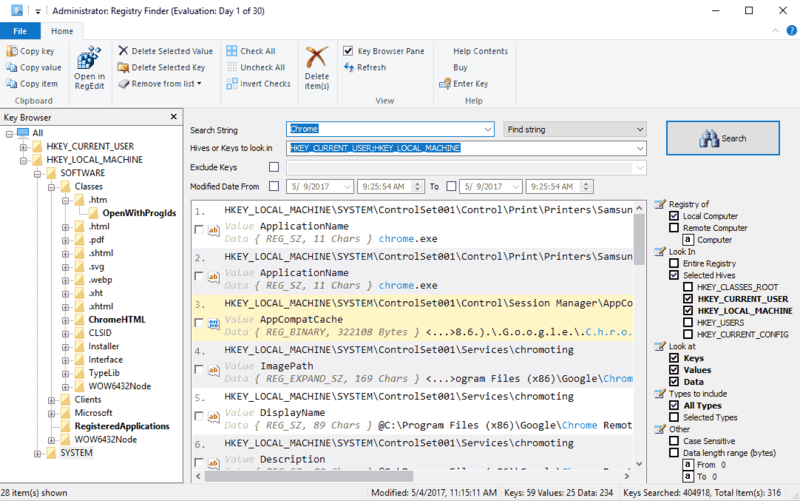 In addition, there’s also a Process Navigator and File / Process Monitor. Using these features you can easily close any running application right from this tool. We also have to mention that this tool offers a powerful file search feature so you can easily find any application or file on your PC. The application also supports computer cleaning thus allowing you to easily clean any recently opened files, Start Menu history, etc. RegSeeker allows you to clean your registry with ease, but you can also manage your backups and restore the registry if needed. Using this tool you can create registry favorites and access them with a single click. In addition, the application also allows you to search your registry so you can use this tool as a registry finder. Searching is rather simple, and you just have to enter the desired string, select the search options and the keys that you want to search. Of course, you can easily open any search result in Registry Editor simply by double clicking it. In addition, you can also search through your search results in order to find the desired values faster. RegSeeker is a solid registry finder, but it can also optimize your PC. 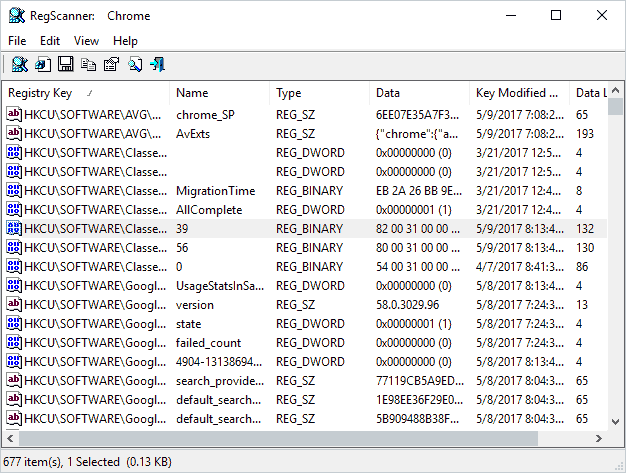 If you’re looking for a tool that will allow you to manage your computer and search the registry, we advise you to try RegSeeker. The application is free for personal use, and since it’s completely portable it will work on any PC without an installation. 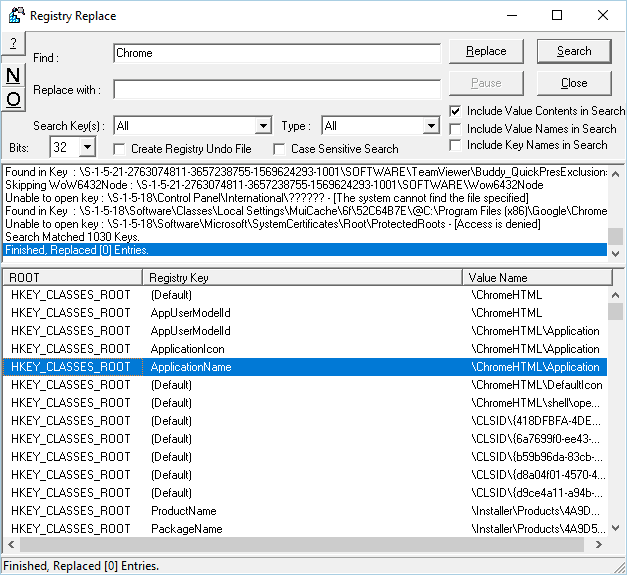 Another application that can search your registry is Registry Replacer. The application allows you to perform a quick search and it even allows you to perform search and replace actions right from this tool. This tool is simple to use, and you just need to enter the desired string and click the Search button. You can also configure search parameters and select what type of data you want to include in your search. In addition, you can also choose which keys you want to search. Thanks to the Search and replace feature, you can easily edit your registry. This feature can also create certain issues if you’re not careful, thereforebe extra cautious. 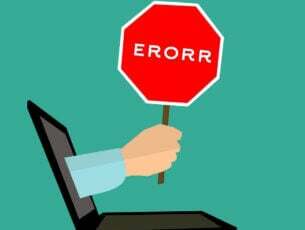 We have to mention that you can create registry undo file right from this application, so you should be able to restore your registry if any issues occur. Registry Replacer also offers basic editing, and you can easily edit any search result by double clicking it. In addition, you can rename any value or delete it right from the results list. If you need to perform more advanced options, you can open Registry Editor right from this tool. Registry Replacer is a solid registry finder that can also replace the selected values. Despite the humble user interface, the application has a lot to offer to its users. We have to mention that this tool isn’t free, so you’ll need to purchase a license if you want to continue using it. The application offers a 30-day free trial, so feel free to try it out. Registry finder applications are extremely useful if you need to navigate to a certain key or find a specific value in your registry. Several registry finders on our list are completely free, so we encourage you to try them out.